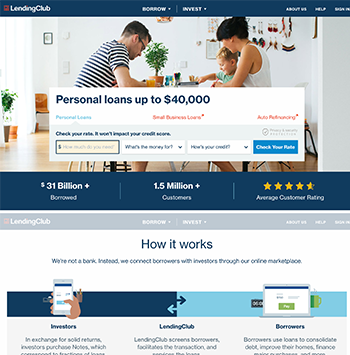 LendingClub is a peer-to-peer (P2P) lending marketplace that connects borrowers with good credit to interested lenders. To make the process easier for you, it is done entirely online: applications take only a few minutes to fill out, you can see your loan offers instantly, and your funds are securely and directly deposited to your account. LendingClub has been a top loan provider for borrowers with good to excellent credit since their founding in 2006. Through their peer-to-peer (P2P) marketplace lending, they have helped fund over $28 billion in loans. Because of the many offers you receive through LendingClub, you can get lower interest rates through them than through a bank. This process is done entirely online, so you do not have to meet a representative face-to-face to receive your funds or discuss the loan terms. To find out if you qualify, you can fill out an application at LendingClub.com. Your information is then evaluated and given a risk grade between A1 (the highest grade with the lowest APRs) and G5 (the lowest grade with the highest interest rates). This grade, that only investors can see, is given based on a combination of your credit score, credit history, employment, income, and your debt-to-income ratio. To find your credit score, LendingClub does a soft pull, which does not negatively affect your score. A few hard inquiries are fine too many recent hard credit inquiries are not favorable to lenders and look like you are regularly applying for credit. You should have an established credit history with at least 3 years of credit history. Average borrowers have 16 years of credit history. You should have good to excellent credit. A 600 on the FICO® is the minimum credit score needed. The average LendingClub borrower has a score of 699. You must not have a debt to income ratio above 40%, which means your monthly bills must not be over 40% your monthly income. Mortgages are excluded from your monthly bill. The average borrower has a non-mortgage debt-to-income ratio of 18.32%. You must be employed and verify your employment and income by providing proper documentation. Your income must be higher than the national household median of $55,775. The average borrower has an income of $76,135. You cannot have derogatory marks like late payments, missed payments, or collections, which automatically disqualifies you from the process. LendingClub requires income and employment documentation like pay stubs, bank statements, W-2s, pension awards, 1099s, and income tax returns, all of which can be uploaded to LendingClub. You will need to enter your contact information, monthly rent or mortgage information, and employment. LendingClub may contact your employer to verify your employment. If your application is approved, you are given a variety of loan offers. Once you choose a loan, investors review your financial profiles and loan grade before choosing if they want to extend a loan. At this point, LendingClub performs a hard inquiry, which knocks around 5 points off your credit score. When everyone has agreed to the loan terms, the loan is approved, you provide your bank account information, and your funds are directly deposited into your account in a few days. The full loan application process takes around seven days, but it can take a longer or shorter amount of time, depending on how much documentation is required, how quickly it is uploaded, and how soon your bank can deposit your funds. LendingClub uses WebBank, an FDIC-insured lender that provides usual bank consumer protection to borrowers. LendingClub ensures that your privacy is respected, so they do not sell any of your personal information to third party websites for marketing purposes. Additionally, their investors do not know your identity and will lend to you anonymously. Because you may want to take out more than one loan, LendingClub allows you to have two active personal loans at the same time, under the condition that you have paid one of your loans on-time for a year and fit the criteria to qualify for the second loan. LendingClub is unique since they offer personal loans, business loans, and medical loans. They provide funds up to $40,000 for personal loans without requiring collateral. These can be used debt consolidation, home maintenance, paying off credit cards, vacations, and more. Personal loans are paid through installments at a fixed rate with loan terms lasting 2, 3, or 5 years. Business loans and lines, which are similar to personal credit lines, are given funds of up to $300,000. If a loan under $100,000 is taken, there is no collateral required. Any higher amount has collateral provided by a lien on the business and personal guarantees from the business owners. Borrowers pay this back monthly at a fixed rate with terms lasting between 1 to 5 years. These payments are automatically deducted from your bank account, so you never have to worry about forgetting your payment. To give you time to make sure you have funds available in your bank account, you receive an email reminder a few days before this is debited. Payments can also be made by mailing a check, but you will be charged a $7 processing fee for each payment. Even though the industry standard is to ask for business plans, appraisals, and title insurance, LendingClub does not ask for this information. These loans can be used for debt consolidation, debt refinancing, business purchases, a new local, remodeling, or marketing. Medical loans are truly important, especially with medical expenses and deductibles on the rise. This loan can be used for medical care normally covered by your health insurance or by procedures that aren’t typically covered, like hair restoration, fertility treatments, dental, weight loss surgery, and more. The two types of payment plans for medical loans provided are extended plans and true no-interest plans. Extended plans are installment loans that are used to pay for medical procedures that are normally not covered by your health insurance plan, like dental work, fertility treatment, hair restoration, and weight loss surgery. You can borrow anywhere from $2,000 - $50,000. These are paid monthly with a fixed rate with loan terms of 24, 36, 48, 60, 72, or 84 months. True no-interest plans provide loans ranging between $499 - $32,000 with 0% APR for 6, 12, 18, or 24 months. Once the no-interest term expires, a variable interest rate of 22.98% is put on the remaining balance. If you can pay off the loan within the term limit, you receive the funds for medical procedures. Direct Lending: LendingClub is a peer-to-peer (P2P) lending platform that ensures investors lend money directly to you. Online Process: The lending is done fully online, meaning that you do not have to meet face-to-face with a lender or representative to receive your loan. Applications can be completed easily at LendingClub’s website and should only takes a few minutes. Competitive Rates: Depending on your credit score, interest rates can be very competitive. The better your credit score, the lower your interest rate. Pay Off Debts: Paying off your credit cards with a personal loan results in your credit score improving due the credit utilization dropping. Additional Perks: LendingClub offers some extra benefits for its customers: since 2014, those with excellent credit profiles receive a special low loan rate of 4.99% rather than the usual 5.99%. Joint Applications: Additionally, Lending Club added joint loan applications to make loan application and approval easier for couples, since couples generally pay off debt better than individual borrowers. Save Money: A personal loan through LendingClub can save you a good amount of money in the long run, especially if you use it to pay off credit card debt. Because your credit utilization is lowered, your credit score increases. On average, LendingClub borrowers see an increase of about 20 points around three months after getting a loan. LendingClub has strict guidelines when it comes to lending. Their customers generally have scores over 600, but if you have any late or missed payments or collections, you do not qualify. Processing the loan can a week or more if verification is required. If you have a degree in a growing field or a high-income career, you may be able to get better interest rates through other personal loan services like SoFi. LendingClub has an upfront fee that is taken out of the loan amount. LendingClub offers loans to 48 states. If you live in Iowa or West Virginia, you are ineligible. LendingClub offers personal loans from $1,000 to $40,000, business loans up to $300,000, and medical loans up to $50,000. To be eligible, you must have a minimum credit score of 600. The APR ranges from 5.99% - 35.89%. Those with excellent credit may qualify for a minimum APR of 4.99%. Loan terms for fixed-rate loans are either 3 or 5 years. There is no application fee or prepayment penalty, but there is an origination fee between 1% - 6% of the loan amount. There is a personal check processing fee of $7, a late fee of either 5% or $15 (whichever is greater), and an unsuccessful payment fee of $15. For those who wish to file for a loan jointly, one borrower must have a minimum score of 600, while the other must have a minimum score of 540. Their debt-to-income ratio must be under 35%. If you have trouble making your payments, LendingClub extends a hardship plan, which lets you make interest-only payments for three months until you have a secure source of income. A personal loan is a large cash fund you can borrow for personal use, like paying off consolidated debt, investing in your home, a vacation, or wedding. How does LendingClub compare to other lenders? LendingClub is unique in the fact that their lending process takes place completely online peer-to-peer. They offer personal, business, and medical loans to those with good to excellent credit. They offer extra benefits like a lower loan rate of 4.99% for those with excellent credit and joint loan applications for couples. How do I know if I qualify for LendingClub? To qualify for LendingClub, you must have a minimum credit score of 600, an established credit history of at least three years, a low debt-to-income ratio, and no derogatory marks such as late payments, missed payments, or collections on your credit report. You must also be employed and have an income high than the national household median.